Tim Parry is passionate about putting small diameter timber to good use. He has worked in Gloucestershire woodlands for over 25 years after initially training as a tree surgeon. In 1987 he first saw the need for more active woodland management while clearing up windblown timber in Sussex, following the "Great Storm". At that point he realised just how much wood goes to waste and he is constantly working out ways to make the most of all the timber produced by coppicing. 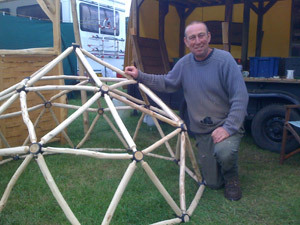 His most recent projects are geodesic domes which are light-weight but also enormously strong. 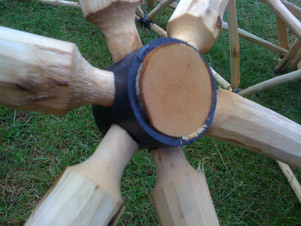 The joints are made using sections of old polypropylene drainage pipe with 6 carefully drilled holes. "It's tough to get the angles right but once it's built its structure gives it great strength. 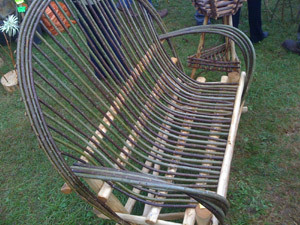 This one is made from hazel but I have used chestnut which works just as well. This dome could be used as a chicken run, for a roof on a small shed, a cold frame or even a small greenhouse." Tim charges £150 for a structure like this. It owes something to Buckminster Fuller with his studies of the use of geodesic domes in construction and his profound recognition that strength through design has many advantages over strength through weight. Based at Hartpury in Goucestershire, Tim has just launched his own website, which describes the woodland management services that he offers, from fencing to rhododendron control, tree planting, ride mowing and charcoal creation. One reason Tim offers such a wide range of services is to make sure that all parts of the trees he works with are used. He says that estate owners who want coppicing done often don't care what happens to the wood that is cut. This has prompted him to do charcoal burning, selling firewood and creating fencing materials. Although he doesn't do hedgelaying himself he does supply hedgelaying materials - mainly stakes and the long poles that go along the tops ("binders"). Like lots of woodland workers, Tim loves simply being in woodlands and when he's doing a charcoal burn he usually stays overnight. "My main aim in the business, apart from remaining solvent, is to promote the use of small diameter wood". Although Tim owns his own woodland he mostly works in other people's woodlands and he has recently been restoring a local 4 acre woodland where he installed a kissing gate, put in stiles, did replanting, coppiced and removed wire from old pig runs. "The main satisfaction was in seeing a small wood improved, looked after and getting it back into productive use. It's really stunning now." Such projects have allowed Tim to employ trainees (including his daughter) which keep alive skills such as clefting as well as creating useful work. Rowan (Great name for a tree dude! ), very kind of you to offer your services. I have a few acres of neglected Hazel coppice. I am interested in owning a woodland site. Its in the blood my great grandfather was a master cabinet maker although he did not own any woodland either. As a retired tree surgeon who is most at home in the woods but unable to buy my own woodland, I like the idea of being able to use my skills in helping others to maintain and possibly increase the productivity of woods they may own. I have my own saws, ropes etc and have a sort of mobile cabin for shelter. Money is not that important as I have a small pension but would like to get involved and find out if this would be of interest to anybody? I liked the tone of your article, it really got me thinking! I have always wanted to have my own coppice to work and improve the environment, while getting a great deal of self satisfaction. I have coppiced some isolated old coppice in my own areas, with a view to creating new environments for wood mice, insects, flora and fauna; and provide me with materials for my retirement- to work with as a form of relaxation and therapy.